The Oxford Children’s Corpus (OCC) is English text corpus including language that children likely read (fiction, non-fiction) or texts written by children themselves. This corpus was prepared within of the project of Children’s corpora has been developing by Oxford University Press. Access restricted unless special permission granted. In the Oxford corpora, there are used Oxford part-of-speech tagset. Banerji, N., Gupta, V., Kilgarriff, A., & Tugwell, D. Oxford Children’s Corpus: a corpus of children’s writing, reading, and education. Corpus Linguistics 2013, p. 315. Kate Wild, Adam Kilgarriff, and David Tugwell. The Oxford children’s corpus: Using a children’s corpus in lexicography. International Journal of Lexicography 26, no. 2 (2013): 190–218. 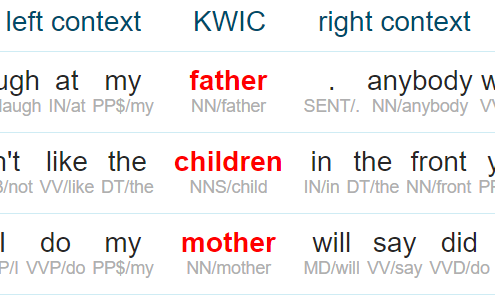 Sketch Engine offers a range of tools to work with the Oxford Children’s Corpus. Sketch Engine offers 450+ language corpora. Generating collocations, frequency lists, examples in contexts, n-grams or extracting terms is easy with Sketch Engine. Use our Quick Start Guide to learn it in minutes.